Husband had raved about the tapas in Zaragoza on previous visits so this was something we were fully intending to try out on this trip. Our first evening though, super tired and extremely hungry we actually stumbled into the first restaurant we found just off the main square. 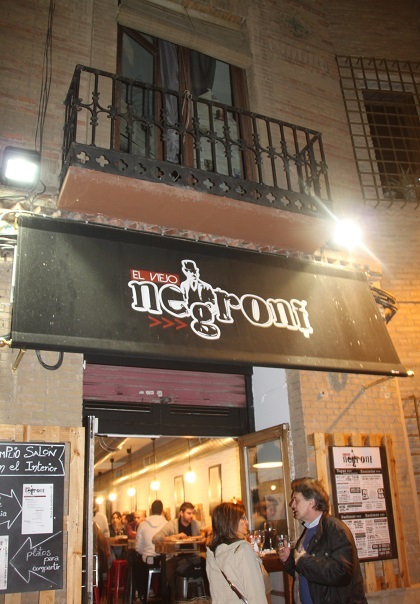 It was an Italian, not quite the thing when you’re in Spain, Son was more than keen and we were too shattered to argue. Actually it turned out to be pretty good, we all had different types of pasta in different sauces and thought it was delicious. 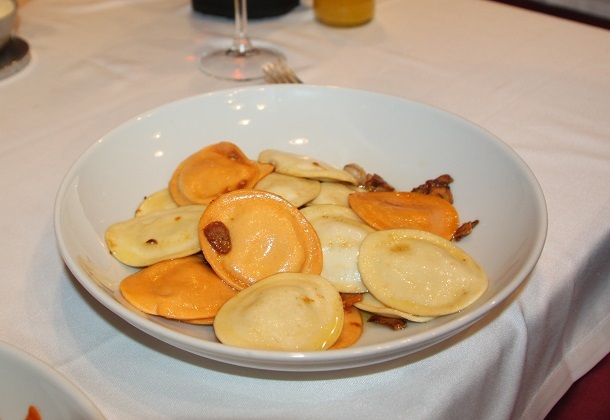 We also had a memorable and filling lunch – several courses and all very tasty in an authentic restaurant chosen by our Spanish friends and one evening we dined alone at another place serving Aragon specialities – a big thumbs up for that too. However in Zaragoza it is all about the tapas. I’ve heard this place described as “the world’s most civilized pub crawl” where people wander from bar to bar washing down each establishment’s specialities from beef to cheese to squid either with a small glass of wine or a tiny glass of beer. Husband has done this every time he’s been to the city. We had tapas one evening with our friends and then ventured out another time alone to attempt it ourselves. The whole place was packed. Everyone in the city seems to do this and almost all were Spanish. 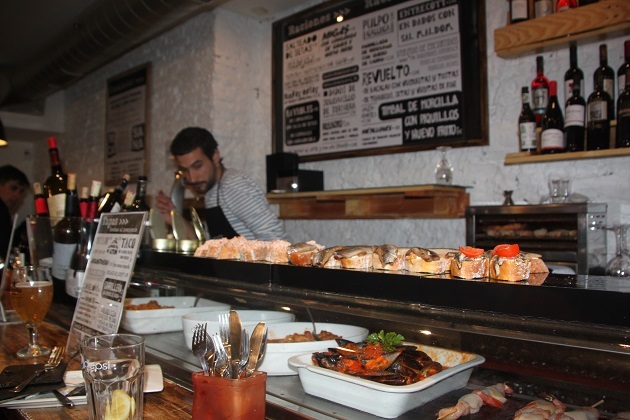 El Tubo is the hub of the bar and nightlife scene, we simply did as the locals do and moved from place to place for a drink and tapas. 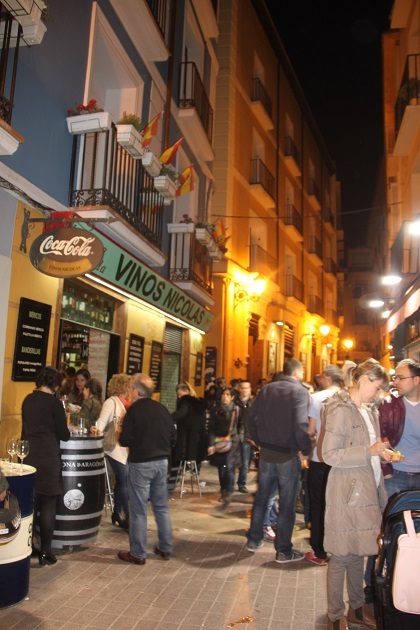 The streets are narrow and there is an easy walking route between the cathedral square and El Tubo. I have no idea where we ate, we just picked random places. Everywhere was really busy but we managed to perch at the bar and point at what we wanted. Son, never the most adventurous eater, was great here – a vast selection of nibbles on offer, he loved the whole concept. Bowls of steamed mussels, platters of ham and sausages, plates of grilled vegetables and just about every type of seafood under the sun, toasted goats cheese, dried tomatoes it just went on and on. We had the most wonderful evening, not hampered at all by our basic Spanish and left agreeing this was a must-do experience in this wonderful city. Oh stop! That tapas looks amazing.My mouth is watering!! It was superb – the only problem was what to choose!! Looks delicious! 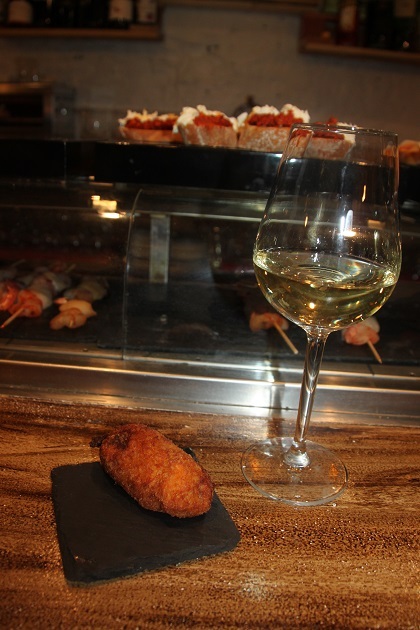 I just love tapas and wine, but not at La Tasca in the UK. At first I thought it was quite nice but they always bring all the dishes at once and then they would be cold by the time we were eating some of them. It’s never like that in Spanish tapas bars, is it! I know exactly what you mean – never happens in Spain!! Here every little place had its own speciality – beef, vegetables etc. and our Spanish friends were very aware of where we should go for each type of tapas so instead of sitting at a table and ordering a host of dishes to share, we actually went to about 12 different places and had one little thing in each. That was great fun and very different for us! Sounds lovely, did you have a drink in each place too? 12 drinks sounds a bit excessive, even on holiday!! I don’t think we would have found our way home after 12 drinks!! That said the drinks were tiny but even so!! Love tapas! This sounds delicious, and what a fun way to spend an evening. It is really loads of fun, a different way to dine for sure! This post made me so hungry! Me too….. drooling just thinking about that lovely Spanish food!! Looks great, so tasty and vibrant. It was and lots of fun going to each place and sampling a little plate of food. Can’t beat tapas. I am in Granada indulging right now! I love tapas! Those pictures look amazing. It was delicious – the only problem was what to choose! I love tapas! These all look good. Everything we tried was superb – and we tried a lot!! Now that’s what I’m talking about..:) That looks like an amazing night. Now I’m hungry. Such a lot of fun George, wandering from place to place and eating a little plate of food in each. Great food too!! Oh dear, second post in a row I’ve read this morning about food, and it’s barely past breakfast! *Stifles tummy rumbles* Actually, this could be a really good way for a veggie to eat (me). Picking the veggie choices in one restaurant could be quite limiting, but if you go from place to place and pick their specialities that could be a whole different experience. Perfect for vegetarians here Anabel – so much to choose from and if you don’t like what you see you just head on to the next place! We loved the whole concept – loads of fun. Absolutely – it was wonderful! Absolutely – such a fun way to dine!! San Sebastian is next on our list! It was, wonderful food and just a completely different experience for us, we loved it. It just all looks so delicate and delightful. I do love a negroni cocktail too. Spain is absolutely my favourite country to have a culinary adventure in! Yummie tapas!! 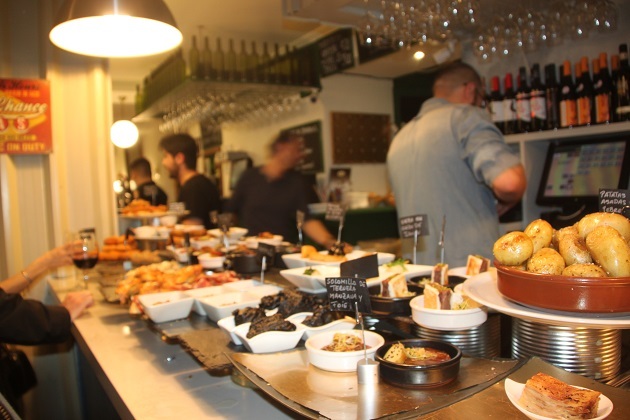 We just love the tapas too – mouth wateringly delicious.